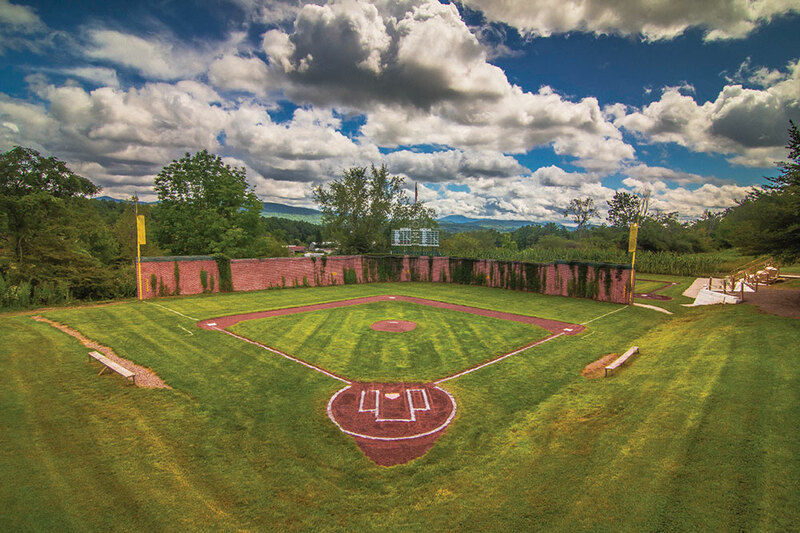 This mini replica of the Field of Dreams field features an irrigation system so the grass is green all summer. A proper irrigation system design can improve reliability and reduce maintenance. Essex, Vermont, is 225 miles from Fenway Park in Boston, 943 miles from Chicago’s Wrigley Field, and 1114 miles from the Field of Dreams in Dyersville, Iowa. 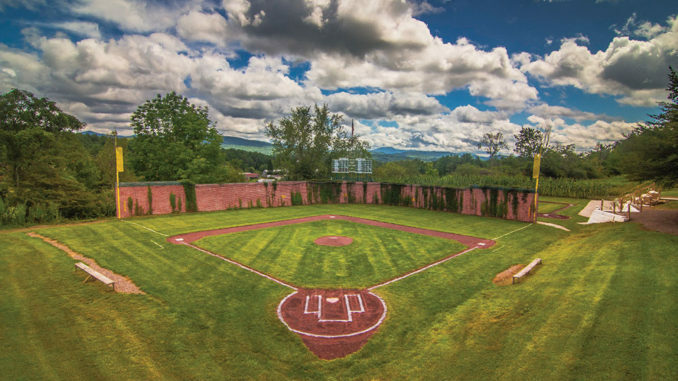 That’s unless you are Pat and Beth O’Connor, who have one-quarter scale replicas of each of these iconic ball fields in their Essex backyard. 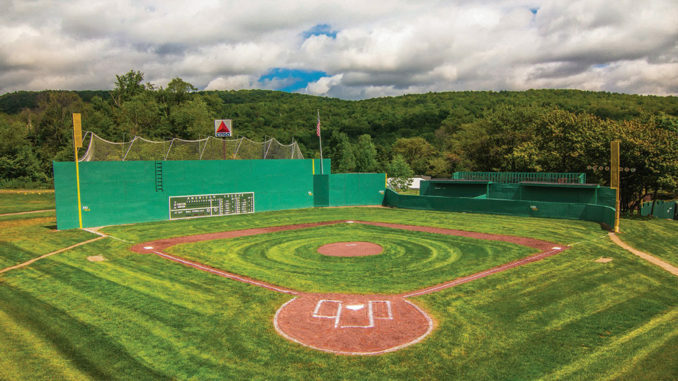 Pat O’Connor, a self-described baseball fanatic, built Little Fenway in 2001, complete with an old-fashioned scoreboard and the infamous Green Monster outfield wall. He added Little Wrigley featuring an ivy-covered brick wall in 2007. 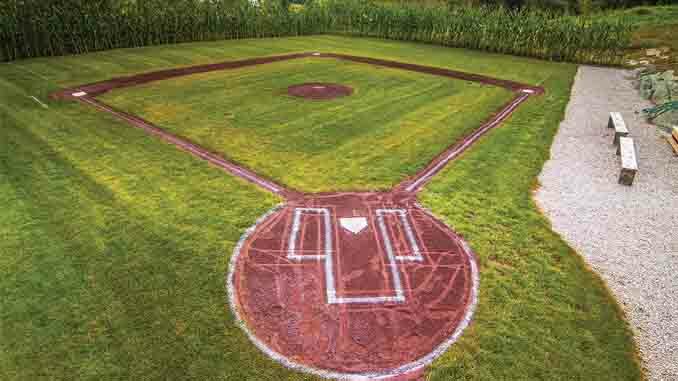 Finally in 2014, Little Field of Dreams with, of course, meticulous rows of corn. For the better part of two decades, the O’Connors have opened up their backyard ballparks to host community fund-raisers, including the Travis Roy Foundation Wiffle Ball Tournament held each August to support spinal cord injury research. At the event, more than 30 teams take to the fields for three days of tournament action. It’s important the fields are green, lush, and ready to go. As the sole groundskeeper of these unique settings, keeping the fields pristine is a top priority for Pat O’Connor. To reduce the time spent on maintenance, O’Connor consulted with local water well drilling, irrigation, and lawn maintenance dealers and contractors to find a smart irrigation and pump control system for the fields. Working with Spafford & Sons Water Wells in Jericho, Vermont, the result is a new sprinkler system featuring a water well with a 4-inch submersible pump and constant pressure controller producing 18 gallons per minute. “We needed a system that would produce 70 psi to run water cannons as well as be on a pedestal outside,” says Jeff Williams, MGWC, CVCLD, the vice president of Spafford & Sons Water Wells and the 2016 president of the National Ground Water Association. Coupling a hydraulically advanced pump with a pressure controller produced an efficient solution for the irrigation challenge at the Essex fields. In designing an effective irrigation system, there are a number of factors to consider. Identify if permits are required, where buried utilities are, and understand local codes. Determine the total dynamic head and flow required. Calculate friction loss considering number of heads and fittings along with the size and length of pipe required. Take into account any elevation changes. Know how much water the well is capable of producing, and understand how much water output is needed for each irrigation zone. If the well output is less than the zone requirement, then additional zones will need to be added. You can then size the pump in order to meet the system requirement. The standard procedure has been to design the pump to meet the greatest output demand of both flow and pressure. However, sizing for the greatest demand results in pump selections that are oversized and inefficient. Water needs change, so irrigation systems don’t always require constant flow rate, but they benefit greatly from constant pressure. Little Fenway (top) and Little Wrigley (bottom) are one-quarter scale replicas of the famed major league baseball stadiums. 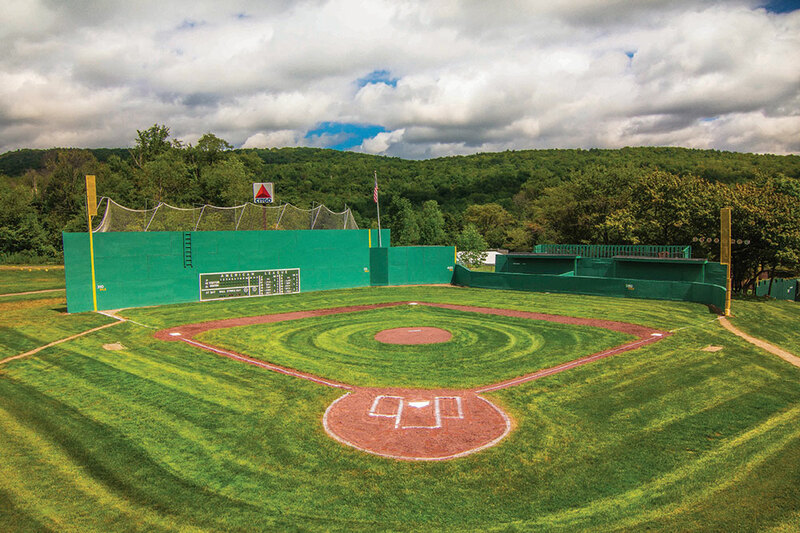 Located in Essex, Vermont, the fields, along with a replica of the Field of Dreams field, have a sprinkler system that enables the owner to keep the fields pristine. The system features a water well with a 4-inch pump and constant pressure controller. Variable frequency drives (VFDs) are electric controllers that vary the speed of the pump, enabling the pump to adjust operating speed and respond smoothly and efficiently to fluctuations in demand. By applying a VFD to an existing system, pumps can work more efficiently, thereby extending product life, reducing energy consumption, and decreasing electrical system stress. Moreover, using a VFD allows the system to consistently operate in the best efficiency range on the pump curve, regardless of output needed. VFDs ensure the appropriate amount of pressure, enabling control over the spray pattern of the sprinkler heads. If a pressure adjustment must be made, all it takes is a push of a button. A motor without a VFD operates at a constant speed. On typical startup, a constant-speed motor is subject to high torque and electrical surges that can reach up to four times the full current load. VFDs, on the other hand, have a soft-start capability that gradually ramps up a motor’s operating speed. Soft-start capabilities associated with VFDs greatly reduce the stress on the motor and related components so pump systems last longer. A VFD offers excellent speed and torque control and helps eliminate water hammer and pressure surgesin piping. The flexibility of an irrigation system including a VFD is one of the many advantages over traditional, constant-speed systems. If space is an issue, the VFD allows for the use of a smaller pressure tank for installation in tighter areas. As technology advances, so, too, will the capabilities of irrigation systems. Embedded intelligence, remote communication capabilities, and application-specific design will result in greater functionality and longer-lasting systems. For O’Connor, a state-of-the-art irrigation system means not having to lug hoses around anymore and devoting more time to ensuring the success of the many fund-raisers he and his wife host each summer. The annual Wiffle ball tournament has raised more than $4,600,000 in 16 years. And O’Connor will be ready to go when the players descend on his fields for the 17th time this summer. 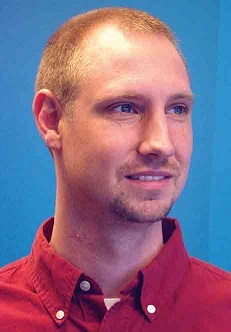 Chris Preston is a residential water product manager with expertise in submersible and jet pumps along with residential pumping systems. 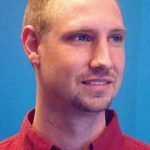 In the past 15 years, he has worked for Xylem as a product design engineer and project manager on multiple global new product development projects. He can be reached at chris.preston@xyleminc.com.